Pork belly is so ridiculously easy I can’t believe I don’t do it more. Granted, there’s a lot of fat on it, but it’s really tasty fat – not the unpleasantly rubbery kind you can sometimes get on chops, but part soft, part crunchy really good stuff. And the fat bastes the meat as it’s cooking, making it sweet and tender and NOM. The lentils are also simple and the mashed potatoes… well, you know how to make mashed potatoes. Pork belly. However much you need to feed however many people you’re cooking for. Use the power of your eyes to judge when you buy it. Puy lentils – about a cup’s worth for two people – multiply as necessary. About 1 pint of stock – meat, chicken or vegetable, it’s up to you. I used ham stock as that’s what I had in and it matched the pork. First preheat the oven to about 170C/340F. Rub some salt on the skin of the pork, put it on a roasting tray and put it in the oven. Leave it for 2 and a half hours THAT’S IT. That is all you have to do. The meat will become tender and sweet and the skin will become lovely crackling. This is the world’s easiest cut of meat to cook, I swear. About 40 minutes before the 2 and a half hours is up, roughly chop up the onion, garlic and sage leaves and heat up a splash of oil in a saucepan. Fry the onion until it’s just turning golden and then add the lentils and garlic. Fry for another couple of minutes and then add half the stock. Bring it up to the simmer and then just let it gently bubble away for half an hour, stirring occasionally. If it dries out, add more of the stock. Have a taste and if it needs salt and pepper, add it. Make sure it’s not too salty because pork is naturally salty anyway. While the lentils are simmering, make the mashed potatoes if you’re having them. Once the pork is done, take it out of the oven, let it relax for a few minutes and then cut it into hefty slices. 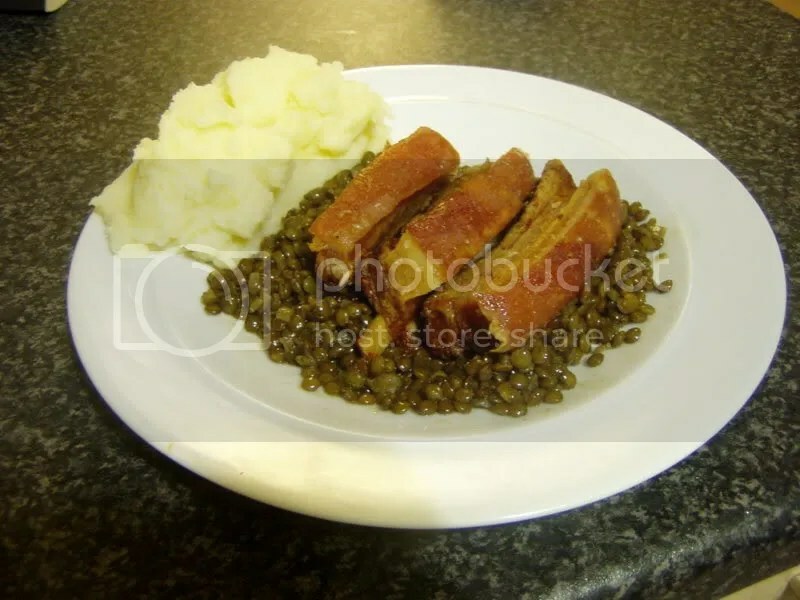 Artfully arrange it on the lentils so it looks extra-nice and serve. Classy, tasty food. This is proper frugal food. A whole ham hock costs me £1.75 – and that’s a posh organic one from my local farmer’s market – and it’s easily made to stretch to three meals. It baffles me why this isn’t a more widely used joint of meat. Granted, the initial cooking takes some time but you’re not standing at the stove slaving away over it, it just bubbles away on its own for a few hours. If I wasn’t so paranoid about accidentally burning down my flat, I’d put this on in the morning, go out and do other things, and then come back and it would be ready. As it is, it’s a pleasant Sunday night ritual to cook a ham hock ready for the week. You also end up with a great big ham bone. As tempting as it is to give this to a dog, a vet friend of mine told me off for doing this because the bone will have softened in the cooking and splinters easily. So. Don’t do that. Celery, leeks, whatever veg you have in except for brassicas like cabbage, broccoli or spouts. They can rather overpower the stock. No salt – the ham is salty enough itself. You don’t need to peal anything, just wash the veg, cut the bulkier items in half and then bung all the ingredients in a large pan. Pour in cold water slowly. 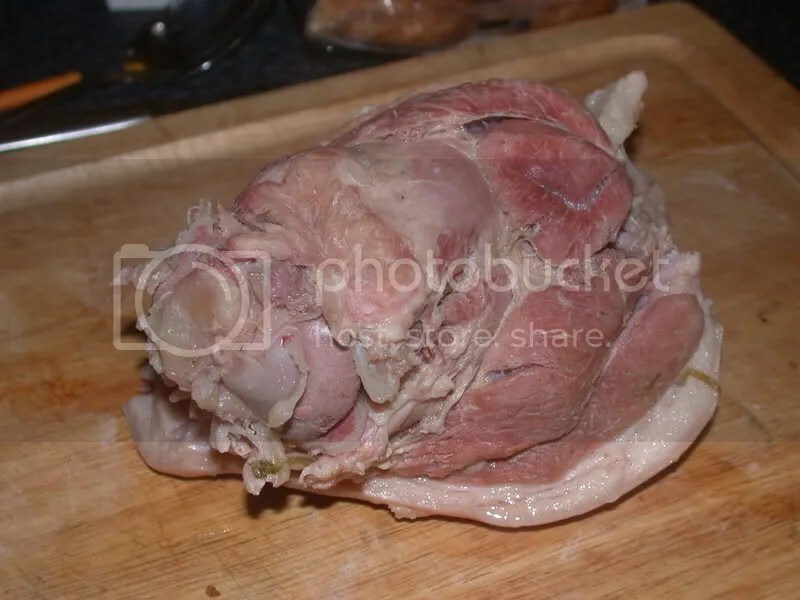 The reason you do it slowly is that you don’t want to disturb the fat on the ham too much – if the fat gets jostled and dislodged, bits of it will float around in the water and this is what makes stock cloudy and greasy. The water should just cover the ingredients. Put it on a low to medium heat on the hob (stovetop). The aim is for the fat and scum to rise to the surface as intact as possible so you can skim it off easily and the stock stays clear. Once it’s come to a gentle simmer, skim off any fat and scum that has risen to the surface with a spoon. Turn down the heat even more. You want the barest of simmering going on – the occasional “bloop” from a bubble every few seconds. This is so that the collagen in the meat softens and dissolves, which flavours the stock and means the meat doesn’t dry out. For the first half an hour or so, check back and skim off any further rubbish that’s risen to the surface. After this time it will probably have all risen. You can do now go off and do your own thing for a few hours. I give it a stir every hour or so to make sure there’s no ingredients poking out of the top of the water and drying up. The liquid will reduce a bit, which is a good thing. The flavours are getting concentrated. After 4 hours it should be nearly ready. Have a taste. If it’s full of flavour, it’s ready. You can use the stock straight away but it might be a bit greasy. Instead, let it cool and then leave it in the fridge overnight. In the morning there will be a layer of fat on the top which you can skim off. 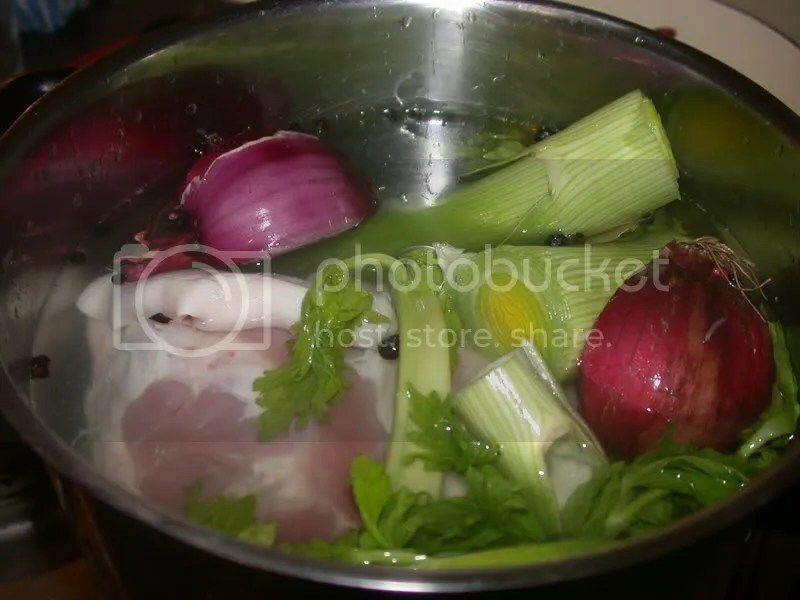 The stock will probably be jellified, which is a great sign because it means you got the temperature right and the gelatin from the bones has leached out and the stock will be really full of flavour. It’ll become liquid again when you heat it up. The stock is now ready for use. Tomorrow’s post will be a selection of recipes for the ham and stock. *Don’t feed pigs with it. That would be wrong. This was a bit of an accidental creation and the photo doesn’t do it justice at all. It was in fact very tasty indeed. I made it up as I went along in that I’ve-had-a-couple-of-beers style of cooking which can so often result in disaster but on this occasion turned out a triumph. I thought that rosemary and cumin go so well with lamb that it had to work… and it did. Give it a go. Bacon, pancetta or lardons chopped. I’m not sure how much I used. 2 rashers will do. Pre-heat the oven to 160C/ 320F. The oven is on quite a low heat because if it’s too hot the lamb will dry up and be tough. Do your prep – chop the lamb, bacon, onion, garlic and aubergine. Put 2 tablespoons of the oil in a casserole dish and get it good and hot. Fry the onion and bacon in batches (I did it in two batches because if you chuck it all in at once this will lower the heat and the meat will stew rather than fry) until they get a bit brown – they don’t have to be cooked through, just browned. It’s good to get some of the burnt bits caught on the bottom of the pan. Set the onion and bacon aside and deglaze the pan by pouring in half a cupful of water and scraping up the burnt bits from the bottom of the pan. The liquid should boil rapidly and reduce quite a lot. Pour out the burnt-bits liquid and set aside for later. Effectively, you’ve made some gravy. Put 1 tbsp oil into the now-empty pan and turn the heat down to medium. Gently fry the onion and aubergine for 10 minutes until they’re soft but not brown. Add the flour, garlic, rosemary and cumin and fry for another minute or so and then add the lamb, bacon and burnt-bits gravy you set aside. Give it a good stir and add the tin of tomatoes and anchovy sauce if you have it. Bring it up to a simmer and then put it in the oven without a lid. If it seems a bit dry, add some water. Stir it every 15 minutes or so for an hour. 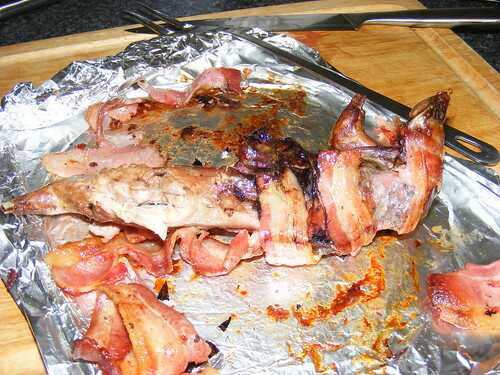 Have a taste – the bacon should have made it salty enough but if you feel it needs seasoning then add it. After an hour it should be ready and the lanb will be nice and tender. 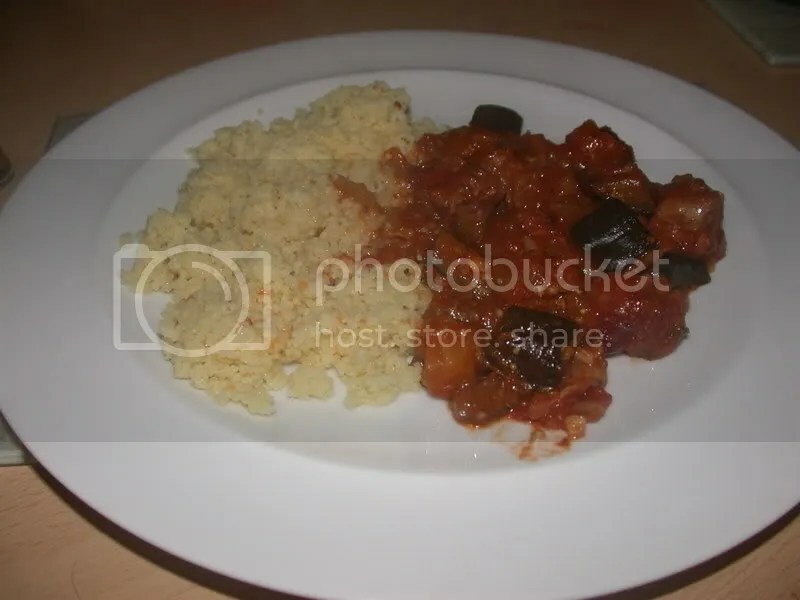 I served mine with couscous but you could also have it with rice, potatoes or pasta. The process of sweating food means exactly what you think it means – making them release water. Almost all cooking methods involve releasing water from food, but when you’re given the instruction to sweat something in a recipe, it generally means that you need to keep the released water from evaporating to a certain extent. For example, when sweating onions or mushrooms, you need to put a lid over the pan in which you are frying them in order to trap the condensation. This means the water doesn’t evaporate, they don’t dry out, and they end up cooking in their own expelled water. As long as you have them on a low heat, they can go on stewing in their own juices for quite a while, intensifying their flavour. A good guideline as to when onions or other ingredients have been sweated properly is when they’re soft and floppy but not swimming in their own juices. 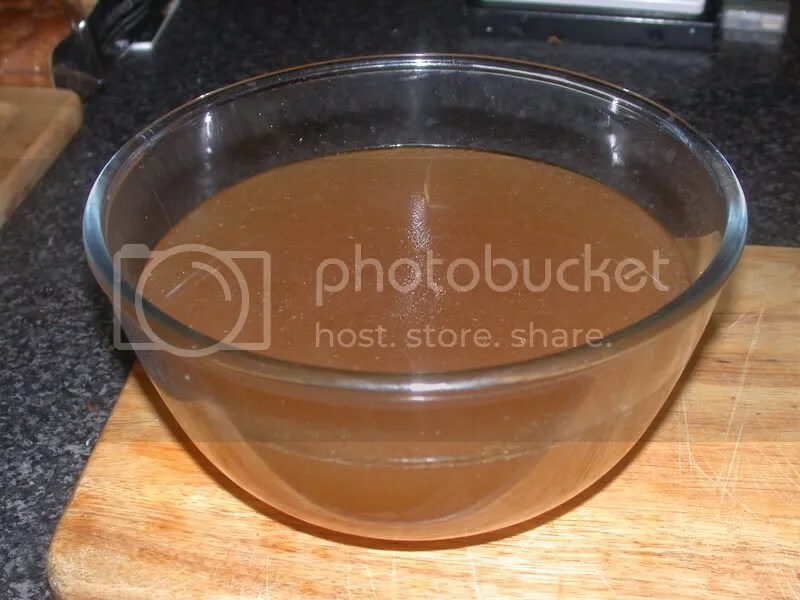 If a massive amount of water is released during the cooking and doesn’t look like it’s going anywhere, just take the lid off and let it evaporate, stirring often. It’s not ideal, and if your ingredient is letting out loads of water, you may want to investigate why it’s got such a high water content. For example, when you fry cheap bacon, you get loads of watery rubbish released from the meat because it’s bulked out with saline solution. But good bacon releases hardly any water, because it’s mostly meat and fat. It’s worth looking out for.